For 2005, all Accords come factory-equipped with side-impact and curtain airbags. In addition, a Hybrid version joins the lineup. Utilizing a V6 gasoline engine and an electric motor, the Honda Accord Hybrid provides better performance than the standard V6 while also attaining better fuel-economy at the same time. 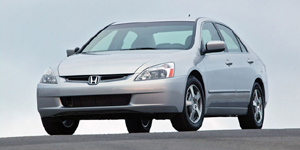 The 2005 Honda Accord Sedan is powered by a base 2.4-liter Inline-4 with 160 hp. Also available is a 3.0-liter V6 with 240 hp. The 2005 Honda Accord Coupe is powered by a base 2.4-liter Inline-4 with 160 hp. Also available is a 3.0-liter V6 with 240 hp. The 2005 Honda Accord Hybrid is powered by a 3.0-liter V6 with 255 hp. Find the used Honda Accord of your choice from a dealer in your area. Search our used car listings now.